Written in the 6th century, The Consolation of Philosophy is the best-known--and most profound--work of the Christian theologian and philosopher St. Boethius. He composed this great work while he was unjustly imprisoned, directly before his unlawful execution. Consequently, The Consolation--which takes the form of a dialogue between Boethius and 'Lady Philosophy'--discusses a variety of important and weighty issues including ethics, the nature of God, God's relationship to the world, the problem of evil, and the true nature of happiness. In particular, an often-emphasized and key theme throughout the book is the importance of both loving God and developing virtue. Because it is written in dialogue form, the literary qualities of the book are somewhat 'light,' which contrasts with the occasionally weighty topics it discusses. The Consolation of Philosophy was enormously influential on medieval and renaissance Christianity--statesmen, poets, historians, philosophers, and theologians all read and studied it extensively. Moreover, it remains even today an important and instructive book. Both compelling and illuminating, The Consolation of Philosophy is profitable for all readers and comes highly recommended. Basic information: Anicius Manlius Severinus Boëthius, commonly called Boethius (ca. 480–524 or 525 AD) was a philosopher of the early 6th century. He was born in Rome to an ancient and prominent family which included emperors Petronius Maximus and Olybrius and many consuls. His father, Flavius Manlius Boethius, was consul in 487 after Odoacer deposed the last Western Roman Emperor. 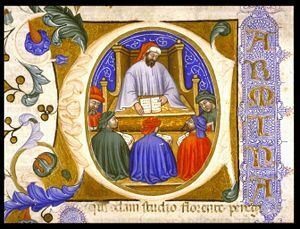 Boethius, of the noble Anicia family, entered public life at a young age and was already a senator by the age of 25.